"Sylok, the Defiled! 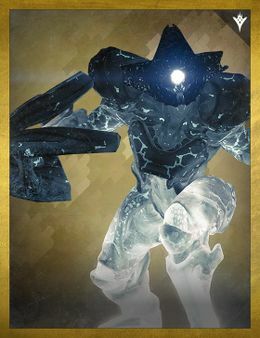 Thirsts for your Light"
Sylok, the Defiled is a Taken Knight that was captured and imprisoned within the Prison of Elders. Following his capture, Reef technicians made several attempts to examine his mental architecture, but were repeatedly and unconsciously compelled by his powers into psychically torturing him. Sylok both reveled in the pain and used it to feed his worm. Sylok is just like any Taken Knight in that he is armed with a Void Boomer and he has the ability to send out Solar projectiles that linger on the ground. However, in Challenge of the Elders, Sylok's Burn ability becomes extremely dangerous. He will fire bigger clusters of those projectiles, and when they land on a surface, they will create a burning spot that will cover a much wider area of effect and last a lot longer, so expect to see flame spots all over the room. In his Grimoire entry, Sylok references an entity called "the Nastareth"; it is unknown to what this name refers. The intro for Sylok's encounter became a meme among Destiny fans.